We take pride in our stripping and waxing service. Over the years, we have been providing this service on a regular schedule for our clients with high satisfaction. 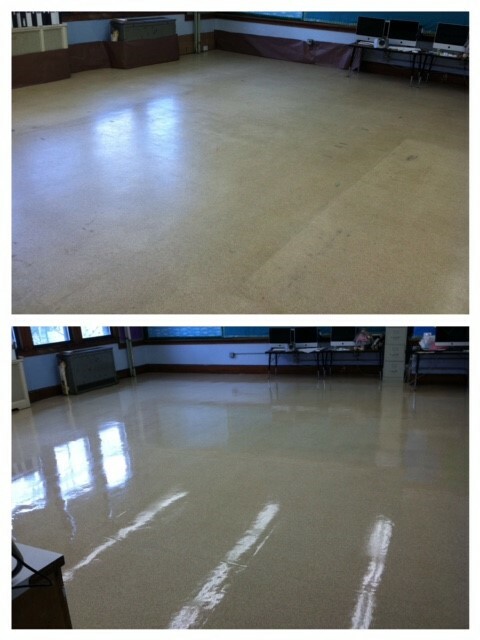 Almost all clients that we service want their floor looking like new and clean. It's obvious in the picture that the school hasn't spend time and money to properly care their floors. Proper maintenance is key to make your floors looking nice and clean. Thoroughly stripping off old wax from the floor is the important step to take when performing stripping and waxing service. When it's not stripped properly and thoroughly, the new wax will not be coated smoothly and you will see blemishes and imperfections under light reflection. After the floor is stripped, it needs to be bone dry before we can apply new wax. Drying time depends on the temperature, so be sure to turn on heat/AC as necessary and move air with a commercial blower. Controlling humidity is important! Once the floor is completely dry, you can start applying the wax. Do this 4 times and your floor will be good as new!